addition to all our other Echo products that we now have in every room. We purchased the first Amazon Echo while the system was in Beta, and received it in January of 2015. We had a good time with it and here we are, 3 years later, with the addition of 4 Echo Dots, 1 Tap, 2 Echo Spots, 1 Fire Stick, and 1 Dash. We are a home full of Echo devices - and it has been a learning experience and it has been fun. We try different things and when they don't work we try something else. Sometimes we even read the Help Files - which are informative. We tend to use these devices as digital assistants and do not play games very much. We do ask questions and have been known to get answers to crossword puzzles (it works) as well as answers to questions of the moment. Perhaps our Google usage is going down. I am learning to talk to devices which I have not always been ready to do. I see all these people talking to Siri, Google, or Cortana and I was not impressed but Alexa? Yes, I can talk to Alexa. I even say "Alexa, thank you". We turn on and off the lights by just saying "Alexa turn on the ________ room lights" - or turn them off the same way. So we do this just walking into the room or if we are in the room we do not have to get up and turn on the lights we just talk to Alexa. One example is we use cooking timers a lot while cooking. We have a light over the sink which we turn on right in the middle of doing something and not wanting to dry our hands and go find the light switch - "Alexa turn on the kitchen light". As of yesterday my wife, who ordered her own Echo Spot, moved the old clock radio away from her side of the bed and there sits her nice new Echo Spot, The Spot now fulfills all the needs of an Alarm Clock with radio. She can wake and see the time, the weather, and hear her favorite radio station in the morning for news and traffic - no buttons to push. The calendar rolls by as well as other notifications - some of which you can control. the weather the way it has been, this is a great way to move from room to room and not lose touch. We can play Amazon Prime Music all over the condo with good sound. 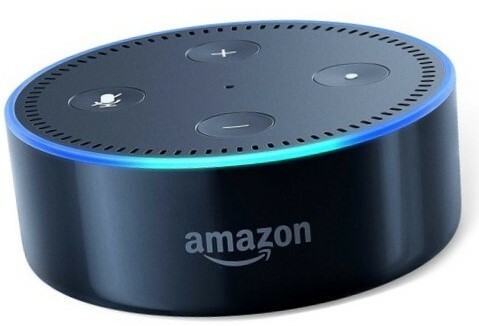 We have Echo Dot connected; 1) to a ___ speaker in the living room, 2) to a stereo system in the basement, 3) and to a small wired speaker in the office. The original Echo speaker in the kitchen and the two new Echo Spots have good sound all by themselves. We can make phone calls and for those with the Echo Show or Echo Spot we can see them in a nice clear picture. We also use it at home to Drop In with another room - no more yelling (my hearing is going anyway and this is easier). Purchasing via any Echo device is easy; however, I do have one recommendation - use a Pin Code to complete the purchase. This will keep mischievous friends and errant youngsters from purchasing items you weren't aware of. I know about that, we've learned a thing or two. You can set up lighting controls for when you are away and can control with the app on your phone - well actually it is all controlled from your phone or the internet. Yes you do have a connection via Amazon's Personal Echo web page. Setting up lighting controls, alarms, shopping lists, and getting favorite radio stations and music everywhere - what else could anyone want. Well maybe an Amazon Show. I'm working on that.